If you plan on walking the High Line on a weekend, you’ll love this free guide we’ve prepared for you! We cover great places near the High Line to enjoy brunch, a proper cup of coffee, as well as important High Line FAQs. We threw in two area maps to make sure you can find them too! 5 What is the High Line? 7 What Can You Do on the High Line? 9 Is the High Line Free? This charming corner restaurant is consistently voted one of the best neighborhood cafés in the city. Breakfast, lunch, and dinner have all been hailed as delicious, so they attract a crowd all day long. Their breakfast menu is a nod to New York, with dishes like The Meatpacker and The Bodega, but cheese lovers take note: the lunch menu comes with an item they’ve designated Best Grilled Cheese Ever, so arrive around lunchtime if that sounds like a can’t-miss to you. Santina is tucked underneath the Gansevoort Street entrance to the High Line (the southern tip of the elevated park), right next to the Whitney Museum, so it’s an easy choice before or after a stroll. Their specialty is Italian food; unique brunch selections include shrimp frittata, zucchini muffins, and French toast made with panettone (that round, candied sweet bread you see popping up in supermarkets around the holidays). Inside, the décor is all blues and purples, smooth hardwood floors, and colorful glass-blown lamps hanging from the ceiling, giving it a bright, Mediterranean feeling. Also located across the street from the Whitney Museum and the High Line’s southern tip, Bubby’s is a pretty convenient post-High Line brunch choice. Owner Ron Silver got started in the restaurant business selling his homemade pies to local restaurants; now, Bubby’s serves a full menu of comfort foods like buttermilk biscuits and chocolate chip pancakes along with their selection of famous pies. The restaurant is spacious and buzzes with conversation, both of which contribute to the owner’s mission to make customers feel like they’re enjoying a meal among friends. And be sure to check out the small ice-cream parlor at Bubby’s run by the popular Brooklyn-based artisan ice cream company, Ample Hills Creamery. Try their exclusive “Floatin’ Over the High Line” flavor (comprised of root beer ice cream with mini marshmellows and chocolate sprinkles). If you’re not in the mood for day-drinking, The Wild Son serves cleansing juices with ingredients like turmeric, ginger, and activated charcoal (which is said to bind toxins to it so they sail out of your body). However, if it looks like an afternoon-drinking kind of day, this is a great place for interesting house cocktails or a cold draft beer. The tables inside all seem to be bathed in sunlight, giving the whole place a light, airy feeling, and their menu offers a variety of brunch-appropriate sandwiches, salads, and mains. The indoor Garden Dining area, complete with Japanese Maple trees and Wisteria vines, will have you lingering over your mango mimosa for hours. Their food selection is pretty appealing, too—where else can you find a Bag of Housemade Doughnuts on the menu? The Park has a full brunch offering, which includes their house specialties like Potato Pancakes with Brown Sugar Applesauce. Having beignets on the menu should be enough to rally the crowds, and that’s only an appetizer. Cookshop’s menu seems to have something for everyone. They use seasonal ingredients from local farms, so their selection varies with the seasons. Dishes are American- style with a Mediterranean twist, since Chef and part-owner Marc Meyer spent time training in Italy. It’s right next to the High Line at 20th street and minutes from Chelsea Market, which is at 16th street. But you might want to make reservations, as this place is pretty happenin’, especially for weekend brunch. A long-time favorite, this vegan establishment attracts even the most hard-core carnivores. Yes, quinoa and kale are on the menu, but so are traditional brunch favorites like French toast, Blossom’s take on a vegan burrito, and a country breakfast made of a tofu scramble with apple sage seitan sausage. Finish up with a decadent vegan dessert. Their flagship Chelsea location—open since 2005—is located inside a two-story landmark townhouse. Every detail at Tipsy Parson is aimed at making you feel at home—the cushioned window benches, the walls lined with books (sort of), and their promise to fill you up with “belly-filling goodness” any time of day. The menu further carries out the promise, with comfort food selections like Mac & Cheese, Fried Pickles, and their famous Buttermilk-Chive Biscuits. Tipsy Parson also proudly serves small-batch cocktails with products they’ve purchased from distillers in NYC and Upstate New York. Fonda is an upscale-yet-inviting Mexican restaurant offering innovative dishes rooted in traditional Mexican cuisine. The seating is a little tight, but if you don’t mind feeling cozy with other diners, come to Fonda for their fantastic margaritas, guacamole, and delicious brunch options (great for dinner too! ), including Huevos Rancheros, Torta de Carnitas, and Burrito Texano. Work up an appetite during your walk along the High Line, and then stop in at one of these New York City brunch favorites! Alternatively, eat early to beat the wait for a table. 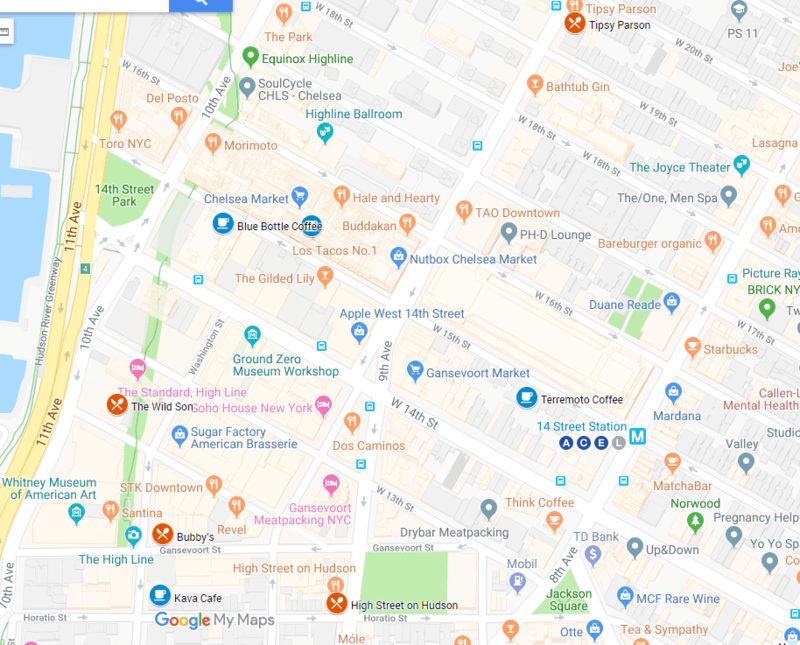 And remember that these restaurants are not only near the High Line but also close to the Whitney Museum, founded in 1930 in nearby Greenwich Village. The popular museum showcases American art across eras and is housed in its new Meatpacking District building designed by Italian “celebrity architect” Renzo Piano. 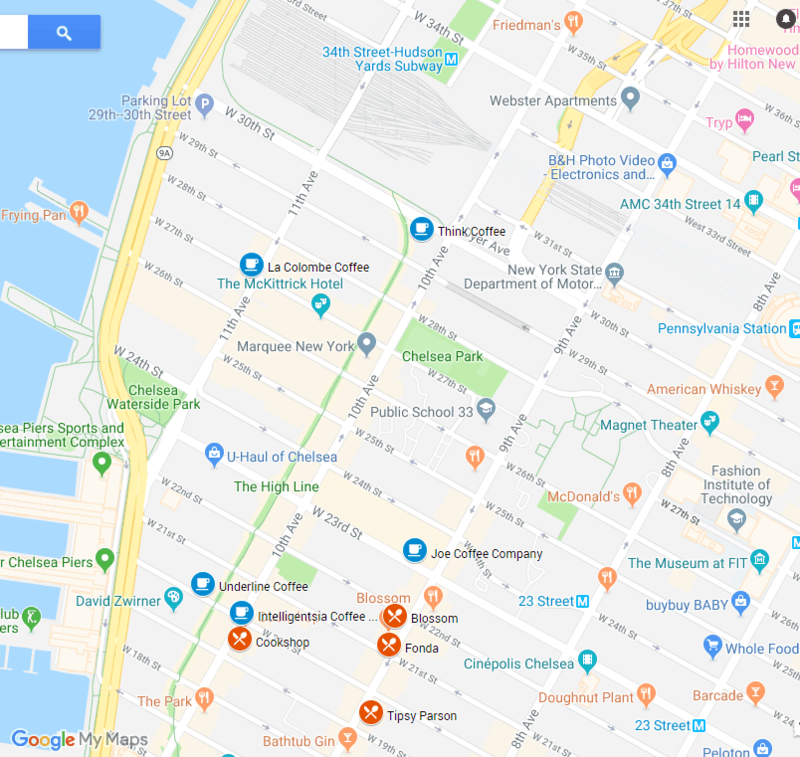 Finally, if you’re visiting New York City for the first time and would like to figure out how to use the subway system to get to the High Line or some of these restaurants, check out our free NYC subway guide. Now onto something else that’s important — great coffee! Intelligentsia Coffee: Inside the High Line Hotel (located in a historic mid-19th century theological seminary) at 180 10th Avenue (between 20th and 21st Street). 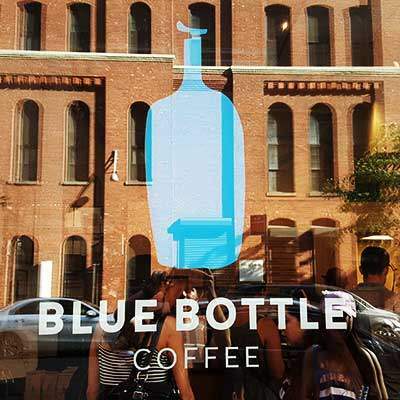 This might be our favorite coffee stop near the High Line, both for the great coffee and the atmosphere. Take advantage of their private outdoor courtyard in the warmer months, where locals bring their dogs and newspapers and sip their morning lattes. Think Coffee: 500 West 30th (just west of 10th Avenue). 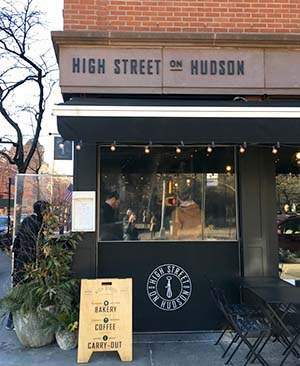 A great stop for coffee and pastries before entering the High Line at 30th street, near Hudson yards. Terremoto Coffee: 328 West 15th Street (between 8th and 9th Avenue). Awesome hole-in-the-wall specialty coffee shop featuring a gilded espresso machine that supposedly cost the owner $40,000! Kava Café: 803 Washington Street (just south of High Line terminus at Gansevoort Street). A great choice if you get off the High Line at the southern tip or need a caffeine fix before heading to the Whitney Museum. The High Line is a unique elevated park built on an abandoned elevated freight line on the far west side of Manhattan. When the first section of it opened to the public in 2009, it became the first elevated park in America. You only have to enter one of its elevators and press “H” to realize its uniqueness. We don’t typically take elevators to get to parks. And when you get out of the elevator, it’s like you’ve landed somewhere else. Suddenly, the honking cabs and loud trucks are 30 feet below; grass, flowers, and trees have replaced street lights, manhole covers, and concrete sidewalks. And the city opens up around you. The High Line starts at Gansevoort and Washington Street in the Meatpacking District (right near the new Whitney Museum) and ends at 34th street and 11th Avenue. The High Line is 1.45 miles or 2.33 kilometers in length. The High Line has multiple entry points — accessible either via stairs, elevator, or both. Here is a detailed map of the High Line (PDF). Yes, one at the southern tip (just as you go up the stairs from Gansevoort street), and one at 16th street near the stairs and elevator. Does the High Line ever close due to bad weather? Yes, the High Line will be closed occasionally due to bad weather — usually a bad winter storm or very icy conditions. You should check their Twitter feed for the latest weather-related closures and hours of operation. As long as it would take you to walk 1.5 miles. Of course, on weekends, especially in the warmer months, the High Line gets pretty crowded, so your walking pace might be determined by crowd levels. Remember, the High Line is a linear structure, so shared walking space becomes an issue as crowding increases. If it’s not crowded (mornings and weekdays are usually the least crowded times), you can probably walk it in about 30 minutes. Of course, part of the experience is to stop and admire the views, take pictures, take a break on a bench to people-watch. So give yourself at least an hour. You can also take a detour into Chelsea Market — the old cookie factory turned popular indoor market — for food, drinks, souvenirs, or even for some shopping. Chelsea Market has an entrance right under the High Line on 10th Avenue, between 15th and 16th street. What Can You Do on the High Line? You can sit on one of many “peel-up” benches and do some people watching. You can do an architecture walk — comparing the old brick and stone factories and warehouses to the new glass, concrete, and steel luxury towers, designed by some of the most famous architects around the world. You can get a tan on one of the wooden lounge chairs on the sundeck between 14th and 15th streets (just south of the Chelsea Market building). You can watch the traffic go by from the 10th Avenue Square. You can stroll the High Line to get to the Whitney Museum at the southern end of the elevated park. 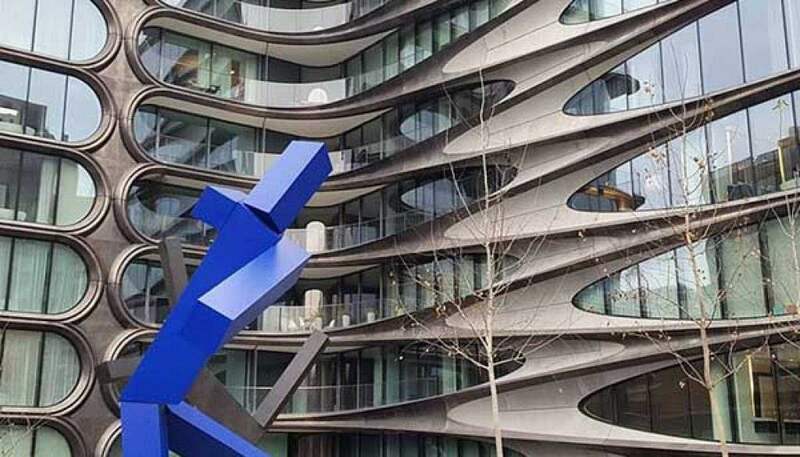 You can walk north along the High Line to get to Hudson Yards and check out the brand-new Vessel , a massive and innovative public sculpture, designed with 2,500 steps for visitors to climb. You can even get food, coffee, or gelato, in the warmer months, inside the old Nabisco tunnel (next to the bathrooms at 16th street). 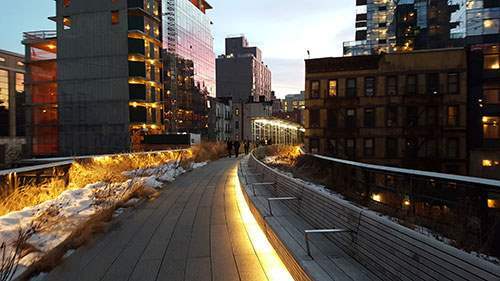 The High Line has also become one of the most popular attractions in New York City and has spurred billions of dollars in new real estate development. The incredible thing is how obvious the idea now seems. 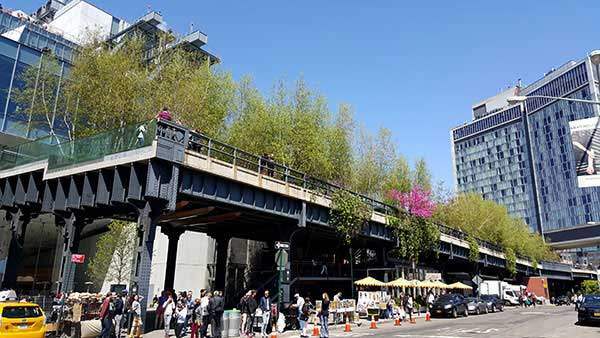 “Of course we should take a rusty, graffiti-covered abandoned rail viaduct above the streets of Manhattan’s West Side and turn it into a popular elevated park!” But this couldn’t be further from the truth. If you were to take a survey 20 or 30 years ago and ask New Yorkers walking by the derelict elevated structure if they thought converting it to a public park would be a good idea, they would probably look at you incredulously and question your sanity. Most people thought of it as an eyesore and probably didn’t even know when or why it was built in the first place. Tourists certainly had no reason to visit the area. The abandoned structure was ripe for demolition, and it was just a matter of time. Or so people thought. So next time someone pitches an idea that seems completely outlandish and unrealistic, don’t write it off right away. You never know, it might just be the next “High Line”! Is the High Line Free? The High Line is park of the NYC Parks Department, and as such, is free for all. However, it costs millions of dollars to maintain the popular elevated park and almost 100% of the funds come from private donations. The Friends of the High Line (the non-profit that manages and maintains the elevated park) handles the maintenance and the fund-raising efforts. Anyone can become a High Line “member” and support this unique public space. You can even adopt a plant or a tree on the High Line!